Liz Duggan making the first Amenity Aid donation to Crossroads RI. 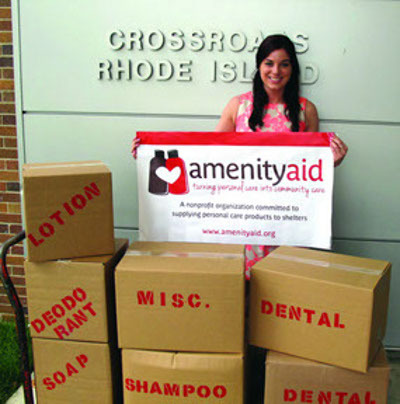 Amenity Aid provides travel size toiletries to RI’s homeless through direct donations to Crossroads RI. Now that it’s November, many people have started making plans for the annual trek back home for Thanksgiving. That means hotels all across the country will fill rooms with travelers from near and far. Normally after these hotel stays, visitors will home travel amenities to use in the future. But what if they go unused, and remain forgotten in the medicine cabinet? Liz Duggan of Amenity Aid, a non-profit organization in East Greenwich offers an answer. Duggan, a Rhode Island native, is the founder of Amenity Aid, a nonprofit charity that donates travel sized amenities to Crossroads Rhode Island. She founded the organization when she began donating her own unused travel amenities collected during her travels. When people began giving their own travel treasures to her to donate , she decided to begin a charity of her own. Amenity Aid was officially founded in March 2013, and Duggan made her first donation to Crossroads this summer, with just over one thousand amenity items. Earlier, this week, she made a donation that was six times that size, with 6,840 amenity items. Amenities donated include 1,1440 toothbrushes, 1,1440 toothpaste tubes, 960 deodorants, 1,000 razors, and 2,000 shaving cream packets. One of the ways that Duggan was able to grow Amenity Aid in such a short period of time was through grassroots fundraisers. 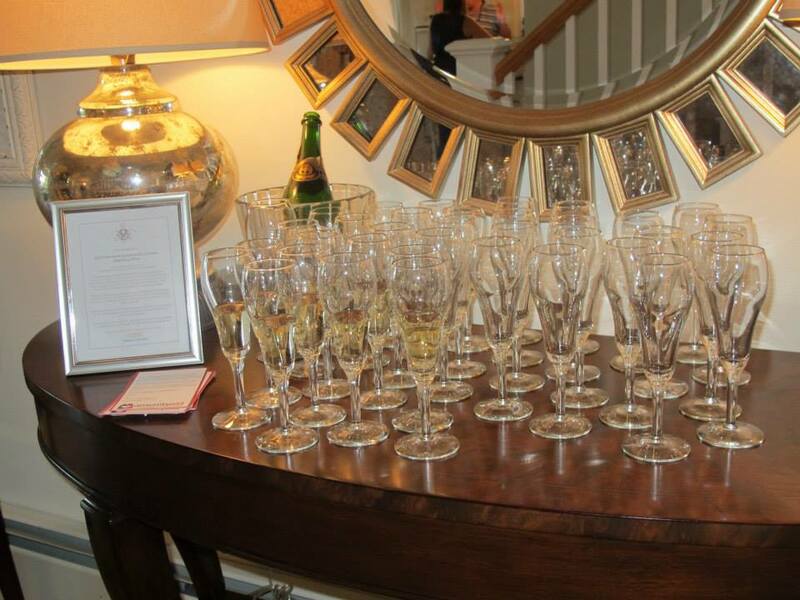 Her most successful fundraiser thus far was a wine tasting event. Most of the money raised from the wine tasting went to the 6,000 item order, which came from hotelsupplies-online.com, an online hotel amenity supplier. Even with the recent growth, Duggan still has plans for the future and is pursuing ways to increase awareness of the problems facing the homeless and her support organization. Duggan even hopes to go green in her future work with Crossroads. Instead of constantly buying plastic amenities, she wants to purchase refillable dispensers for shampoo and conditioner to put in the shelters. Karen Santilli, who is the Vice President of Marketing and Development for Crossroads, has been working with Duggan over the past year. With the items that Amenity Aid donates, Crossroads will make care packages for their clients to use whenever they need. According to Santilli, this provides them the opportunity to feel better about themselves, especially given the situation they are in. Santilli also mentioned that Crossroads has never worked with an organization like Amenity Aid that solely focuses on donating the travel sized amenities. Normally, individuals will donate their old ones that were around the house. However, this just makes Amenity Aid’s work all the more important to Crossroads. “What’s nice about Amenity Aid is that they ask us what we need and then get it for us,” said Santilli. Amenity Aid is working on obtaining non-profit 501(c)3 status, but that does not stop anyone from donating. It definitely has not stopped Liz Duggan and her organization from moving forward. More information about Amenity Aid can be found here on their website and on Facebook.